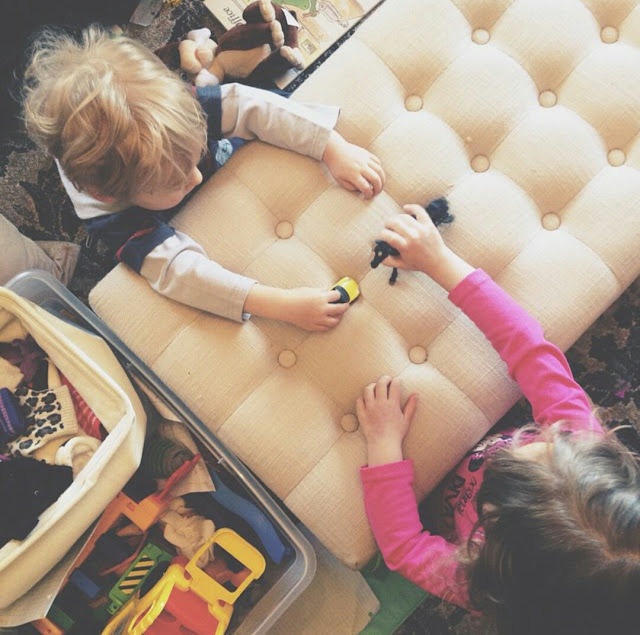 For many parents of toddlers, nothing is scarier and more dangerous than the COFFEE TABLE. I have heard it again, and again from my clients. 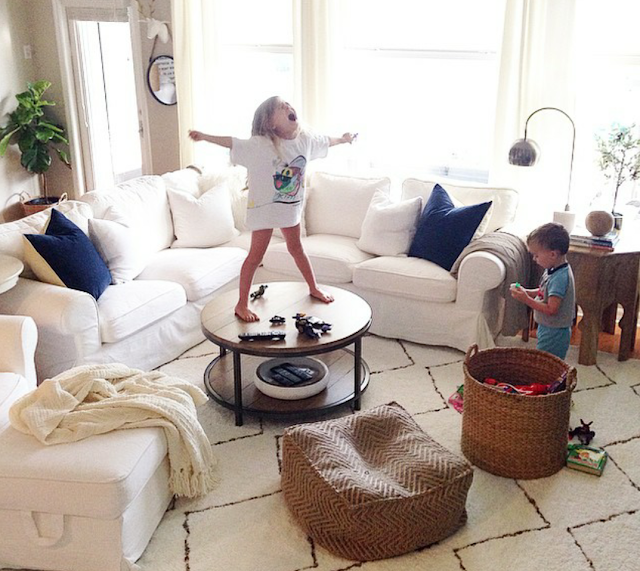 They don't want to buy a coffee table because of "the children." Trust me, I get it. As a parent of two beautiful kids, I know. I remember when my oldest started walking I wanted to protect her from every right angle and hard surface in my house. I swear to you, I thought about putting a helmet on her. NOT KIDDING. And that's why they seem so dangerous in a parent's eyes! BUT... We as parents deserve a place to put our feet up on while watching T.V.! Or, to have a place to put our wine glasses down after the kids go to sleep! Coffee tables are a necessity! 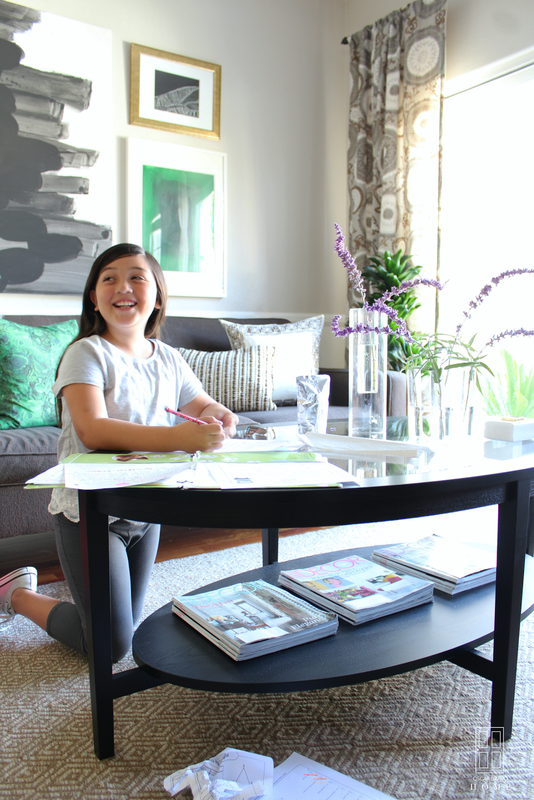 Well, I'm here to share a couple tips for coffee tables that are both stylish and functional in a kid-friendly environment. My talented friends Gloribell and Rebecca (Designers, Bloggers and Moms) shows us in their photos that you don't have to sacrifice style when you have kids. The round shape of their coffee tables allows traffic to flow freely without having to worry about getting bumped by a sharp corner. Also note that Rebecca has used a beautiful basket to house her kids' toys. Large baskets are so functional and look good in your home. 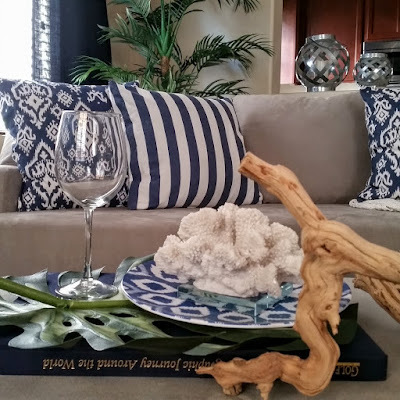 Your coffee table doesn't have to be wood-top! Get a nice upholstered ottoman that is soft and cushioned. 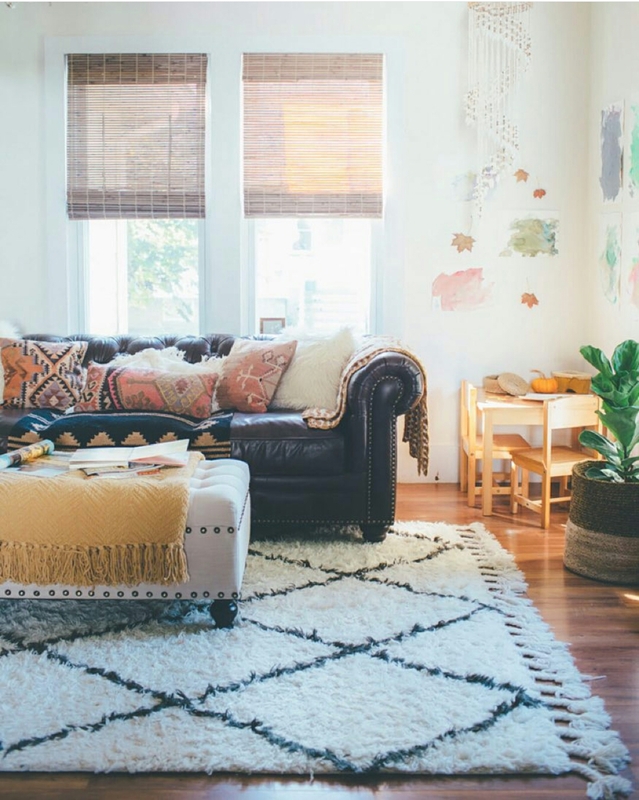 My friend, Alice is doing it right in her boho living room. Beautiful space that the whole family can enjoy. 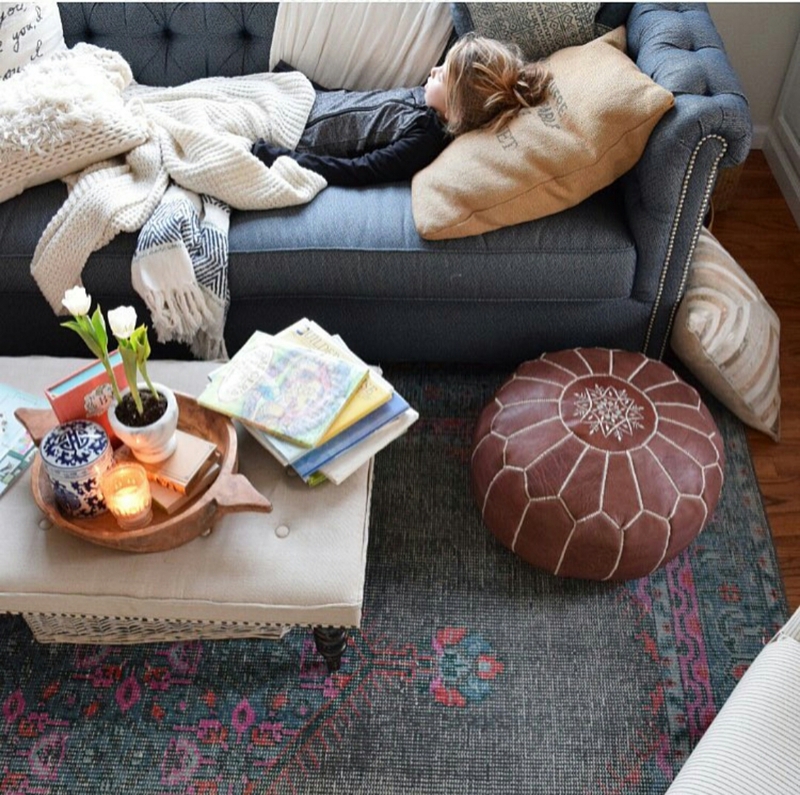 If you decide to go with an ottoman, don't forget the tray! Having a flat surface on top of an ottoman allows you to place drinks and a few accessories on top of it. Also, if your kid is at the age where they like to pull stuff off of tables, simply take the whole tray off of the table and move it to your dining room table! Then, just put it back for "wine time" when that baby goes to bed! That is the key! Rounded edges; padded furniture and durable finishes. 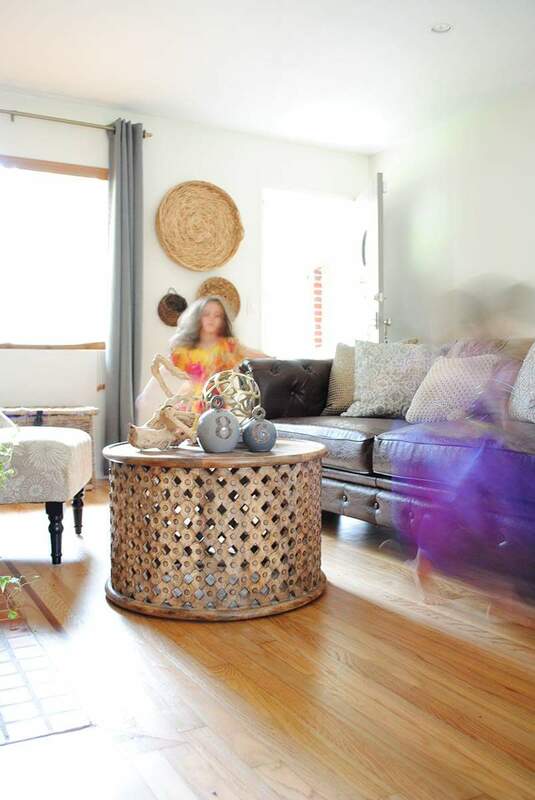 Kid-friendly furniture doesn't have to be plastic, or be finished in bright, primary colors! Be thoughtful when choosing your items. How is your family going to use it? How will it look in a couple of years? AND how will it look IN MY HOME! As parents, we do everything for our kids. We want them to be safe and happy. But we also deserve some time for ourselves. We should be able to unwind in our homes when the day is over (without the distraction of toys everywhere). You DESERVE A BREAK! 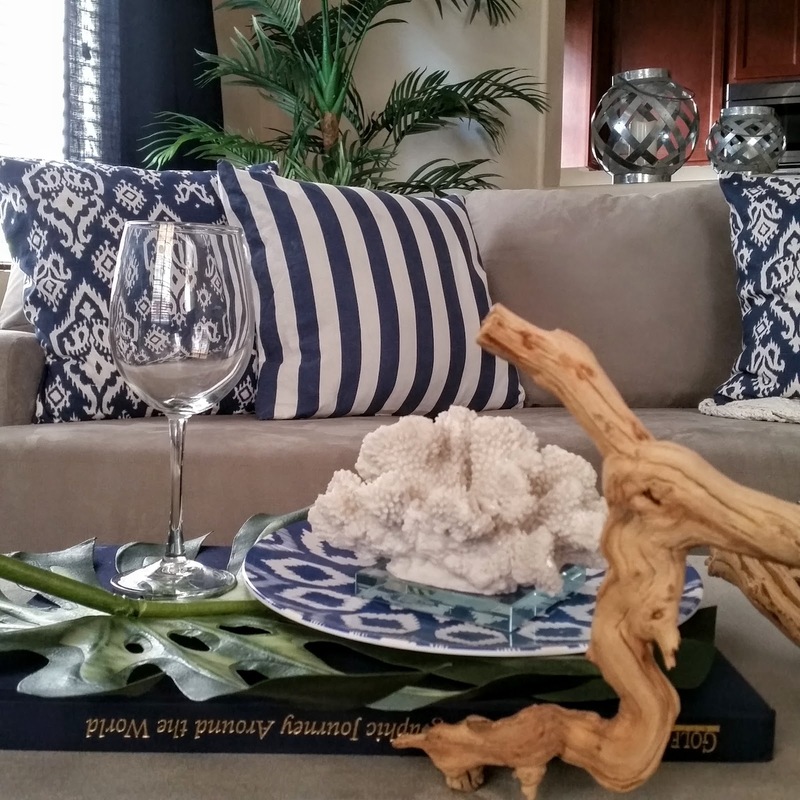 YOU DESERVE A COFFEE TABLE! AND COFFEE! Anyway, I sourced a few coffee tables for you that I think would work in a home with small children. Hope I was helpful! Thanks for stopping by! If you haven't done so already, subscribe by email so that you can stay up to date with more tips! If you ignored my annoying pop-up, then just scroll down to the bottom of this post and subscribe! LOVE YOU! Good tips! We need to little careful while choosing something for kids. All the accessories should be kid-friendly as they can get hurt. Having sharp edge tables or something else is a bad idea and parents should stay watchful for it. I like your options for coffee tables. These are truly kid-friendly. Thanks for sharing all these. Baby Furniture. Speaking as a mother of 9 children and nan of 10 grandchildren plus 4 stepchildren and 13 stepgrandies and also a professional nanny and childcare worker I found coffee tables to be a source of great grief. Early on I just got rid of my coffee table because it was the source of one accident after another. I like the suggestions here though , well done. My only daughter however insists on a glass topped coffee table upon which her baby toddler is already having accidents upon. Some people just refuse to listen to safety advice or experienced mothers no matter how sweetly kindly or gently the advice is given.